A portable generator can be used for a range of different purposes. They can work well to be an added source of safety for times of emergencies, such as an unexpected power outage, or in the event of a natural disaster. They can also be used when there are planned power outages in the area, but you still need to have power for your home. In addition, they are beneficial for construction sites, farming, outdoor events, camping, RVing and more. However, finding the best portable generators is not always easy given the fact that there are so many choices out there. To help make things easier on you, we’ve compiled the following list of 10 of the best. 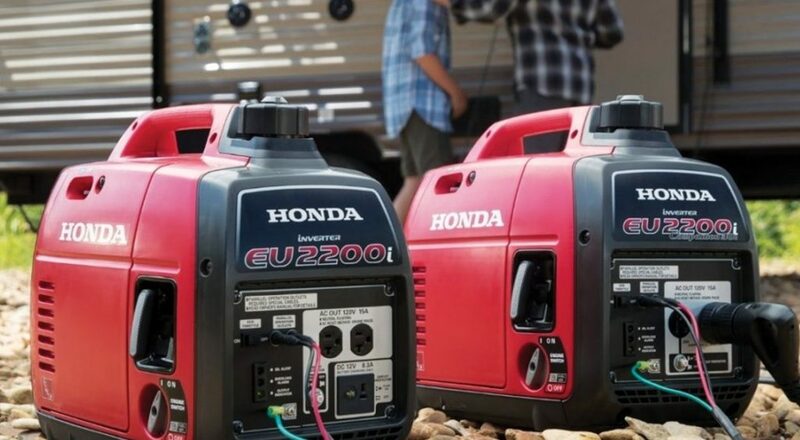 The Honda EU2200 is the best portable generator in the 2000 watt generator class. It has the ability to operate many different types of appliances. Because of the versatility that it offers, it has been a solution that many have turned to for use when they are camping, RVing, construction job site, or to help power their home in the case of an emergency or power outage of some type. One of the other reasons that the Honda EU2200i is a popular choice is the fact that it tends to be very quiet. In fact, it will operate between 48 to 57 dBA. This means that is about the same level of noise as having a conversation with someone. You will not have to worry about the sound of the generator being too loud and disturbing for you or for your neighbors. Many people choose to purchase two of these units because it is so simple to parallel two units with a cord or cable. This will then provide you with double the amount of power – 4400 watts. This unit is very fuel efficient, as well, which is yet another reason for its popularity. Depending on the amount of work it is doing, a single tank of gas is going to allow it to run for between 4.0 hours and 9.6 hours. Although the unit can provide a substantial amount of power, you will find that the overall size of the unit is still quite small. This helps to make it an efficient and convenient option. The Champion 3500 Watt RV ready portable generator is a fantastic choice for those who need to have some additional power when they are out camping and enjoying the wilderness… and still need to have some modern conveniences. As with many other types of portable generator, you will find that these can work quite well when used for construction sites, as well as for a cabin, or for home use during emergencies. One of the standout features of this unit is the fact that it has been designed with safety in mind. It has a low-oil shutoff sensor on it and 0.6-quart oil capacity. The machine is also highly reliable at 4000 starting watts and 3500 running watts. You can get up to 12 hours of running time from a full tank of gasoline. The machine also offers 68 dBA from 23 feet away, so you will not have to worry about it being too loud. Outlets on the generator include a 120V 30A locking outlet, a 120V 30A RV outlet, and a 120V 20A household outlet. The Champion 3500 watt also offers a volt guard, which is going to prevent any overload from occurring. This helps to ensure that your equipment is kept safe from any spikes in the voltage. The voltmeter will let you monitor just how much power the unit is outputting, as well. When the unit is purchased brand new, it will include 3-year limited warranty support and lifetime technical support. This is a trusted name and a trusted model when it comes to generators, and it could be the right choice for you. One of the primary selling points of the WEN 56200i is the fact that this 2000 watt portable inverter generator is extremely quiet. It should operate at 51 dBA when it is at a quarter load. This makes it quieter than many conversations and only about as loud as a window air conditioner at max. Having a quite generator is a real benefit, as it means you are not going to be too loud for the neighbors, or for yourself. It is also good when you are out camping, as it should not send the wildlife scattering. This unit is EPA III and CARB compliant. The 79.7 cc stroke OHV engine produces 2000 surge watts and 1600 rated watts. It can produce quality, clean power to provide the energy needed to safely operate various types of electronics without there being a danger of damaging them. This includes items such as a television or computer, or even your smartphone and tablet. This inverter generator feature two three-prong 120V receptacles, as well as one 12V DC receptacle and one 5V USB port. One of the other features that help to make this a great choice is the WEN Eco mode. When this mode is used, it will allow the motor to adjust the fuel consumption. In addition, the unit is parallel connection compatible, so you can hook up another unit whenever you need to have more than 2000 watts. Finally, the design of the Wen 56200i is lightweight. It only weighs 48lbs, so it should be easy to carry thanks to the low weight and the carrying handle. This 2000 watt portable inverter generator has a lot to offer in a compact and convenient package. The unit is capable of providing users with 1700 running watts, with the AC maximum outputs of starting watts being at 2200. The generator can provide clean and stable power, which is not only reliable but is also safe enough for those who may need to use sensitive appliances and other electronics that are hooked up to the generator, such as computers. The fuel tank can hold 1.2 gallons, and it will run for up to 10.75 hours at a 25% load. Another one of the excellent features of this generator, which makes it a good competitor with the other ones in this list, is the fact that it is parallel ready, so it is fast and easy to connect two inverters together so you can get twice the power. It also offers a built-in handle, which makes it nice and easy to transport to wherever you need it. Thanks to the size and the ease of use, you will be able to get quite a bit of use out of this unit no matter where you might be. It can work well for the home if you need to have some power during a power outage or a disaster, for example. It can also work quite well for tailgating, construction, camping, and more. The economy mode even provides noise reduction and better fuel economy. Without a doubt, one of the standout features of this generator is the fact that it is possible to stack the units on top of one another. This can provide you with a substantial amount of power, without taking up as much floor space. These units are parallel ready and can connect to another unit to give you the added power that you need. As with many of the other generators in this list, you will find that this Champion unit will offer clean power, so you will not have to worry about using it with your sensitive electronics. The unit features two 120V 20A household outlets with clean electricity, as well as a 12V DC outlet. When you use the smart economy mode on the unit, you will be able to reduce the electrical load and reduce the sound of the generator when it is operating. Using this mode is also going to provide you with better fuel economy, and it can extend the life of the engine. Because this generator will only produce 53 dBA from about 23 feet away, you will find that it can be used for many different locations, where you might need power, but you don’t want a loud unit. It would be a good solution for tailgating, camping, and other outdoor excursions, and for construction projects where you need some quality power. Westinghouse is a popular name with many different types of appliances, and they tend to make dependable products. That is certainly true when it comes to the Westinghouse WH2200iXLT generator. The unit can offer 2200 peak units and 1800 rated watts. This is a light and easily portable unit, as it only weighs 43lbs. It features two 120V 20 amp outlets. This could be a nice option for those who need to have an emergency backup for power in their home just in case the power was to go out. It could also be a good option for those who are thinking about bringing a generator with them when they are going camping. It is fuel efficient, and it has a noise output of only 52 dBA. This means that it is relatively quiet, especially once you get about 20 feet away. The tank is 1.3 gallons, and it has a 13hr runtime when it is running at 25% load. As with other generators in this list, you will find that the Westinghouse WH2200iXLT is parallel compatible, so you can combine it with a second unit of the same type to increase the amount of power that you are getting. Overall, this is a very dependable gas-powered unit that is easy to see and can work out well for those who need to have some extra power. Here is another generator from the popular Champion brand, this one offering up 1500 starting watts and 1200 running wats. With a full tank of gas, which is 1.5 gallons for this generator, the unit has the capacity to last for up to 10 hours at 50% load. This generator was designed with safety in mind. It has a low-oil shutoff sensor and a 0.4-quart capacity. One of the other nice features of this unit is the fact that it is quiet. The noise level is only 65 dBA from 23 feet away. The generator features a 120V 20A household outlet, and it has ample power for use in the RV, use while camping, tailgating, boating, and heading out fishing or for a trip for the weekend. It can even work quite well when you need to have some extra power around the house for one reason or another. This unit weighs 61.7lbs, but it is still relatively easy to move. The unit comes with a voltmeter, so you can monitor how much power is being outputted quickly and easily. This could be a very good and durable generator to bring along with you for just about any outing that you might have. It also features Cold Start technology from Champion, so you can be sure that it is going to start even in cold weather. This could be essential if you are suffering a power outage in the middle of winter. This generator is going to be a good choice for those who need to have a bit more power than what smaller units like a 1200 watt can offer. With the Honda Power Equipment EU3000i, it is even possible to start up recreational vehicle AC units that are up to 13,500 BTUs. While this unit does weight 78lbs, and it might not seem to be as portable as some of the smaller units, it does offer a substantial amount of power. Even at this weight, though, it is still the most compact and lightest inverter generator of this power level from Honda. In addition, this unit has a handle and wheels, so you should not have too much trouble getting it from place to place. The generator contains the eco-throttle system, which is exclusively offered through Honda. It ensures that the unit has excellent fuel efficiency. Depending on the load, it can run for up to 7.7 hours on a single tank of gas. In addition, you will be happy to note that even though this does provide a substantial amount of power, it is still quiet. In fact, it only gets to between 57 and 65 dBA. This unit could be a good choice for many different types of uses. It could work well for a home generator in the event that the power goes out. You could also use it for construction projects, for camping, and more. This is a large generator that tends to be best suited for larger projects, such as construction sites, or for emergency situations. However, it could certainly be used for other purposes if needed. The generator provides 4750 starting watts with 3800 running watts. One of the other features of the unit that helps to make it a standout is the fact that it is a dual fuel generator. This means that it can run on either gas or propane. When you are using gas, a full tank of gas will get you about nine hours of runtime. When it comes to propane, a 20lb propane tank will provide up to 10.5 hours of running time. The generator has a 224cc Champion engine with Touch Start, so it is nice and easy to get things going. It features a 120V 30A RV outlet, a 120V 30A locking outlet, and two 120V 20A household outlets. All of these are secured by Volt Guard. This means you will not have to worry about power surges damaging your appliances. This generator is very light and compact, meaning that you can take it with you just about anywhere that you go. It only weighs 29lbs, and it has an easy carrying handle. Whether you are camping, or you need it around the house or the job site, it is ready to go. The generator operates quietly, as well. It is generally between 53 and 59 dBA, which is about the same level as a conversation. This means that it is not going to disturb you, your neighbors, or anyone else. The inverter technology in use with the unit means that you are going to have clean and stable power. The unit is efficient, as well. It will operate for up to 8.3 hours on a single tank depending on how much of a load it is handling. This is a highly reliable and easy to use generator, and it is protected by an oil alert. This means that the engine will shut off if there is low oil pressure detected. These are the top 10 portable generators that are currently on the market today. As you can see, there are different sizes and power levels, and you should be able to find a solution in this list that is going to work perfectly for your needs. Thanks Trey we appreciate the reviews. My wife and I are campers and we like to camp away from the campgrounds sometimes, therefore we need portable power. We decided on the Honda EU2200, it’s the newer version of the EU2000 I believe. It’s easy to carry for an older man like myself in his 60s. Still a bit heavy but easy to maneuver around. It gives us 2200 watts of power to pump electricity to our coffee pot, small fridge, water heater, tv, etc. It’s a bit more expensive than some of the other brands like Champion or WEN, but its hard to beat the ruggedness of a Honda. They also have a very good warranty. No problem Kirk! Happy Camping!